For years past, adults and children of all ages had dreams of growing up to be an adventurous lighthouse keeper. That dream is slowly dimming as the world automates its lighthouses. by Joe Moran The Guardian, Saturday 12 April 2014. Growing up, I wanted to be a lighthouse keeper. 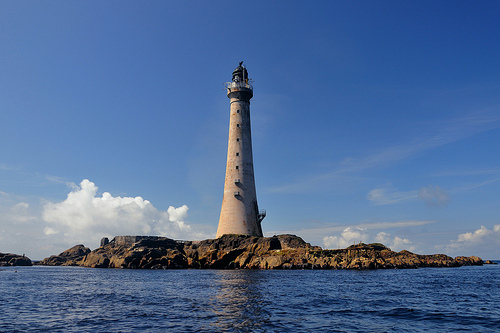 Just like Moominpappa in Tove Jansson’s Moomin books, my ambition was to live on the loneliest lighthouse on the remotest skerry farthest from land. It didn’t end well for Moominpappa, the island he and the other Moomins settled on being barren and desolate, inhabited only by a silent fisherman who turned out to be the ex-lighthouse keeper driven mad by loneliness. It didn’t put me off. I have since met many compatriots who have had the same dream, for there is something about lighthouses that seems to speak to our islanded souls. more . . . This is too good not to reprint. The Lighthouse Keeper Wonders by Edgar Guest (Wikipedia article on Edgar Guest). This is one the better lighthouse poems. I sometimes wonder too – all those beautiful lighthouses destroyed because of automation. is now to be run by a set of gears. to be put ashore by a mere device. will run to an automatic light. are timed and set so the light shall burn. set plants about in early Spring? a cry for help in darkness hear? the lighthouse rooms as I used to do? The title is a tiny bit misleading. The government is not contracting to paint the lighthouse (is not doing the job themselves using government personnel as in the olden days) but is contracting out to private persons to do the work previously done by government workers. However, dealing with the problem is not as straightforward as sending someone the tab. Peggys Cove is owned by the federal government, which is currently getting out of the lighthouse business. The Nova Scotia government is in negotiations to take over the site, but no date has been set for completion of the talks. So who is going to paint Peggys Cove, and many other abandoned lighthouses? Here’s the link for all those interested in bidding. Go create an account on Merx and bid away your $400.00 to paint it. Now that Merx site is very interesting. It shows Canadian Public Tenders for jobs the Canadian Government puts out for bids. I searched but could not finds anything lighthouse-related, but maybe you will have better luck. Let me know if you find anything. There are some interesting jobs available, but one thing comes to mind. What has happened to the Public Works Department of the Canadian Government? They used to do all the painting and construction projects..Does Public Works no longer exist? Aha! I found it! It is now called Public Works and Government Services Canada (PWGSC). They pay me my pension, but do they do anything else? Check out PWGSC website and see if you can find out. Not much there about painting old lighthouses. Lots on procurement and disposal though. So I guess they just buy stuff and dispose of it when no longer needed. Is any reader working for PWGSC that can better fill us in on the workings of PWGSC? So, unless the community is going to do the work and pay for the job itself, I guess Canadian lighthouse are headed for a dim future (pun intended). In Memorium – Prospect Point Lighthouse – Automated! Three nautical miles east of Point Atkinson, situated at the base of a cliff, stands the lonely and short-lived lighthouse called Prospect Point. The light was first manned in October 1888 and was overshadowed by the importance of the Signal Station on the cliff above. This signal station operated in conjunction with Brockton Point to signal when ships were coming into or out of Vancouver Harbour. In January 1926 the poor lightkeeper was informed by the Department of Marine and Fisheries that the lighthouse would be electrified and would then be operated by the Prospect Point Signal Station. He was out of a job after years keeping both systems working. The photo below shows what replaced the lighthouse – a concrete block structure with a light on top and several small electric foghorns. Photo from pwhsu48 Webshots page. As mentioned above, the Prospect Point and Brockton Point signal stations monitored ship traffic in and out of Vancouver harbour. 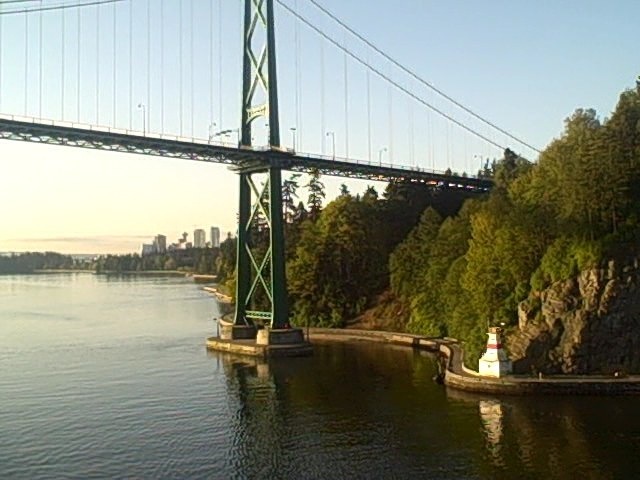 Below is a photo taken from the mouth of the Capilano River showing Prospect Point today and the the probable view from the Capilano lighthouse. 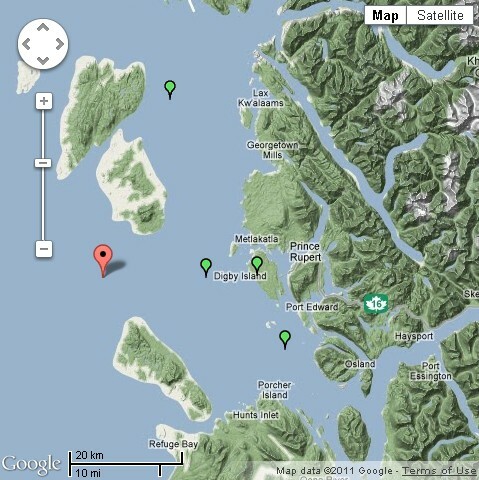 Beside it is a Google Earth map showing the exact location of the three lighthouses. Photo from Glamorous_Life Flickr page. 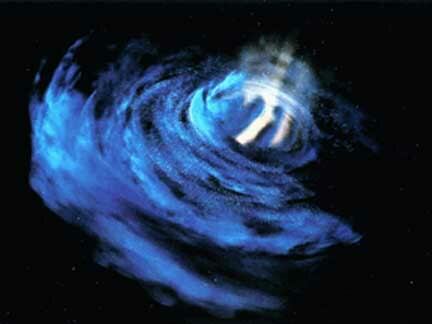 Photo from Google Earth printout. 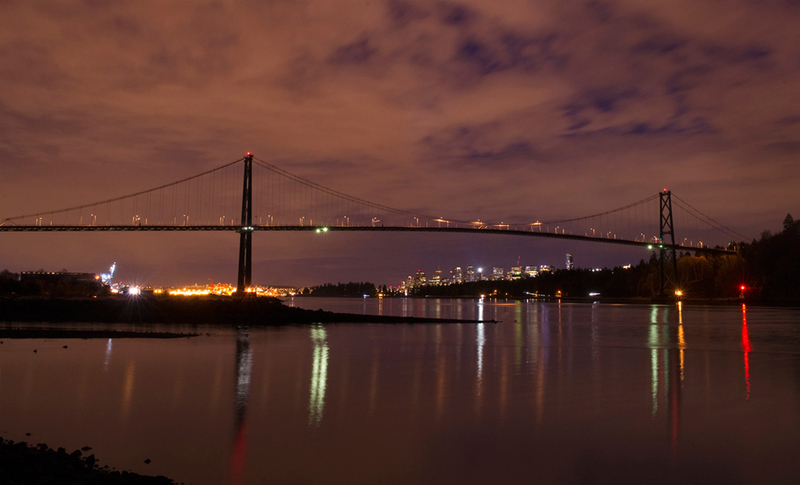 In this 360° view you can see Prospect Point off the right-hand side of the bridge. As the scene sweeps across the harbour, The sandbanks of the Capilano River come into view with the dolphin visible in deeper water. (Zoom in using Shift, and out with Ctrl key; Pause by clicking on photo). In June 22, 2011 I published an article about the Triple Island 3rd order lens which has now been replaced with a flashlight (see the article). I have never spent any work time on Triple Island, but I have landed there once or twice with the Coast Guard helicopters as a passenger. I never did have any time to explore. There are two lighthouse keepers on Triple Island who rotate every twenty-eight (28) days with two other keepers. I always wondered what it would be like to live there in this day and age. Triple Island Lighthouse is a Great Place to Fish! Automated in 1977, these videos show what happens to a sadly neglected automated lighthouse. What a place for a B&B! Thanks to Discovery Island website for the information. Just for your information discoveryisland.ca does not seem to be working anymore. Take a look at the tower and lantern that the keepers so meticulously maintained. Originally the keepers at Discovery Island would manual record the wind speed and direction, air temperature, sea temperature, humidity, sea level pressure, wave height, ocean swell height and direction, visibility and sky condition and then report it back via radio about seven times a day. Now due to the automation of the lighthouse the weather reports have gone the same way. The new weather Instrument are mounted on the top of the tower and measure the wind speed and temperature and then automaticly report it back to Environment Canada, when it is not broken. Only twenty-seven MANNED lighthouses are remaining says the government! 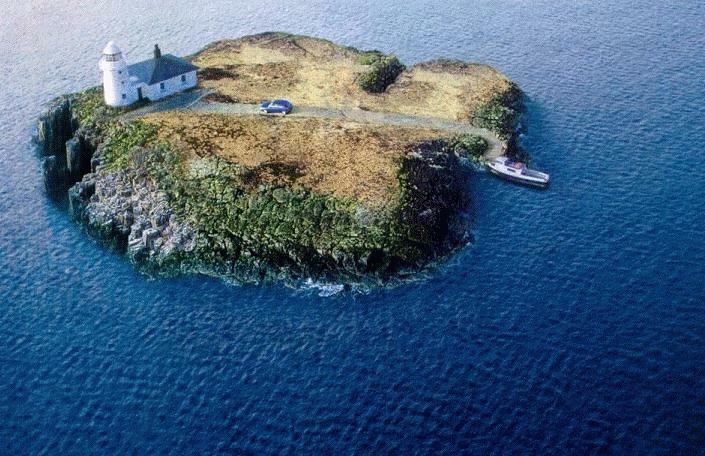 This is how you go about saving a lighthouse. Work for it! Work together for it. Councillor Rob Lantz of Charlottetown electoral ward 3 (Brighton), Charlottetown, PEI, Canada has given me permission to repost this article here from his Ward 3 Brighton blog. The Brighton Beach Range Front Light is a designated heritage resource under the city’s Zoning & Development Bylaw. The lighthouse was built in 1890. 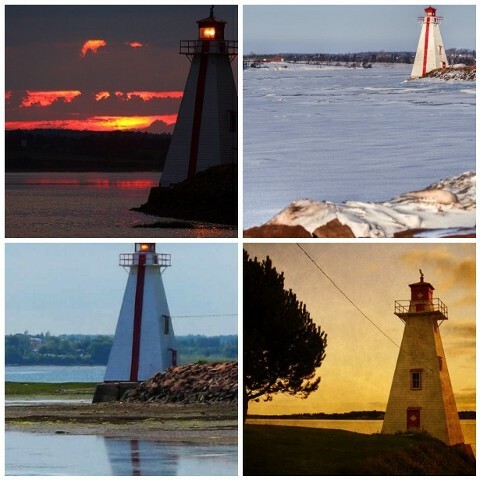 It is an iconic symbol of our nautical heritage and provides a scenic shoreline vista that is photographed as much as, maybe more than, any other site in Charlottetown. Random photos pulled from the photo sharing site Flickr. Music Video – Roots – And No One’s In The Lighthouse! This song is from the album Undun by the Roots. It is called Lighthouse. The words to the chorus are interesting. Imagine lying in the ocean and seeing a lighthouse nearby and no one sees you because it is unmanned! Imagine the feeling of fear! Think automation? 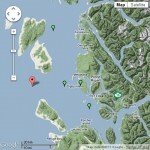 Unmanning lighthouses? The rest of the lyrics can be found here. The video below is just the song as it is sung by the group. I think you must hear it a couple of times to get the meaning of the song. I know I did. At least according to Dan’s Lighthouse Page! The following article by Bella Bathhurst from the Notting Hill Editions Journal was passed to me by a BC lightkeeper. It was so well written I asked permission to reprint it here. Pay special attention to the author’s reasons for keeping lighthouses. We are jettisoning lighthouses at our peril, writes Bella Bathurst, a lighthouse historian. Even in the age of GPS, they remain immensely useful, and retain deep symbolic power. Twelve years ago, I wrote a book called The Lighthouse Stevensons about the construction of the lights around the Scottish coastline by Robert Louis Stevenson’s family. I was lucky to arrive at exactly the right moment. In 1999, the last of the British lights were being automated and the few remaining keepers were disappearing towards extinction. The men I spoke to were mostly at or near retirement age anyway; most saw the logic of their own removal even if they weren’t persuaded by its effects. At the beginning of the third millennium, you don’t need three grown men to change a lightbulb. But what none of those last keepers would ever have understood or sanctioned was the idea of the lights themselves being switched off. 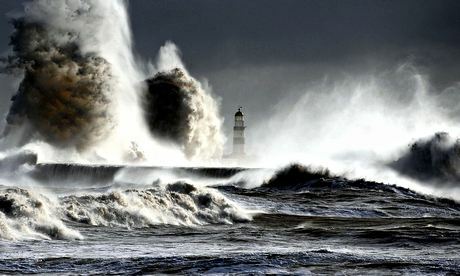 Could the UK lighthouses be about to go in the dark?